Baronger Group is a custom homebuilder that has evolved around the building talents of its owner and founder Mitch Goldstein. 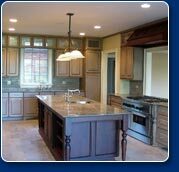 In 1993, Mitch decided to start a full service building company that would focus on aesthetics blended with functionality � all done with a commitment to exceed our customer�s best expectations. Our staff recognizes that building a new home is an exciting event in a clients life. To assure the homeowner is comfortable with all aspects of the project, a detailed plan is developed before work begins. The scope of work, timeline and budgets are optimized to meet customer requirements. A team of craftsman and mechanics particularly suited to the demands of the project are assembled to ensure quality. Value engineering and schedule management are used to assure projects are finished on time and within budget. Commitment to quality in both construction and client service is one of the reasons owners throughout the Chicagoland area have found the home building process so rewarding with Baronger.